Brendan Rodgers continued the fine-tuning of his Liverpool squad for a return to Champions League football by swooping to sign Southampton captain Adam Lallana shortly after the talented playmaker had returned from the World Cup in Brazil. The Reds succeeded in a highly competitive race to secure the signature of the sought-after attacking midfielder in July 2014, bringing in a player who has progressed from the lower reaches of the football ladder to become a senior England international. Blessed with an innate ability to create and capitalise on chances, this is a footballer who is not merely comfortable but confident in using both feet, while the versatility that allows him to play in any and all possible midfield positions was likely of considerable appeal to the man who will now manage him. 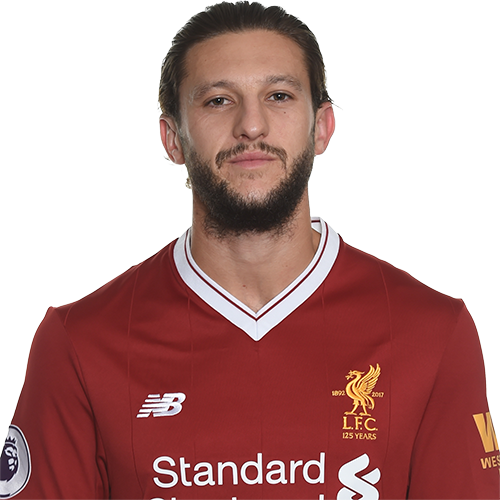 Born in St Albans 26 years ago, Lallana moved to Bournemouth as a five-year-old child and took his fledgling steps towards a professional career in the game when he learned the tools of his impressive personal trade at the local club's Centre of Excellence. Naturally, only a short amount of time had passed before nearby scouts were alerted to the young talent, and a switch to the much-vaunted Southampton academy - where the likes of Gareth Bale, Alex Oxlade-Chamberlain and Theo Walcott were nurtured - was organised in 2000. Adam was 18 years of age when he made a maiden appearance for the Saints' first team six years later, featuring in a League Cup tie against Yeovil Town in August 2006, which was followed by his league debut within a matter of days. From there, Lallana's development continued at youth level for club and country, although a temporary return to Bournemouth in the form of a four-match loan spell subsequently brought several opportunities to prove his ability with the seniors at St Mary's. The playmaker has been a mainstay at Southampton ever since the commencement of the 2008-09 season, in which he clocked up a total of 40 appearances and contributed one goal in the Championship as his team unfortunately suffered relegation. It was perhaps the last major disappointment of the new signing's career to date, however, as the Englishman dedicated himself to the cause of hauling the Saints back into the big time, beginning with 20 goals in all competitions across the next season in narrowly missing out on the play-offs but lifting the Football League Trophy. And Lallana was a central component of back-to-back promotions during the two years that followed, driving from League One to the Premier League; his personal performances earned him not only a growing reputation but also inclusion in the respective PFA Team of the Year at the end of each campaign. His displays were further rewarded by the captaincy of his club as they prepared for life in the top flight and the responsibility of the armband was one that Adam relished, thriving in an attractive Southampton team that retained their Premier League status with ease in 2012-13. England recognition seemed the logical next chapter - he would eventually turn out for the Three Lions against Chile in November 2013 - and Reds fans who had not previously been alerted to his attributes were made aware when Rodgers' side were turned over 3-1 and 1-0 by the Saints in March and September of the same year respectively. By the final weeks of the recently completed season, the whole country and beyond were taking notice; nine goals and six assists in the Premier League put Lallana in the Team of the Year alongside new teammates Steven Gerrard, Daniel Sturridge and Luis Suarez, while a place on the six-man shortlist for the PFA Players' Player of the Year came as little surprise. Midway through May 2014, Roy Hodgson named the now 26-year-old in his England squad for the World Cup in Brazil, where he appeared in all three group matches and started one as the side were disappointingly eliminated before the knockout rounds. Within days of his returning home, the Reds moved quickly to agree a deal with Southampton for the playmaker, who gleefully followed Saints teammate Rickie Lambert by completing a medical and sealing a transfer to Anfield ahead of pre-season.